Farmer Xiong Pao Her and Michael Yang of UCCE examine irrigation pump retrofitted with SWEEP funding. In California, Asian farmers play a critical part in providing culturally relevant food to Asian populations throughout the state. California currently has the largest population of Asian farmers in the nation and that number is rapidly increasing. Yet in places like the metropolitan area of Los Angeles, the considerable demand for Asian produce is met with a lack of sufficient farmers to feed that demand. 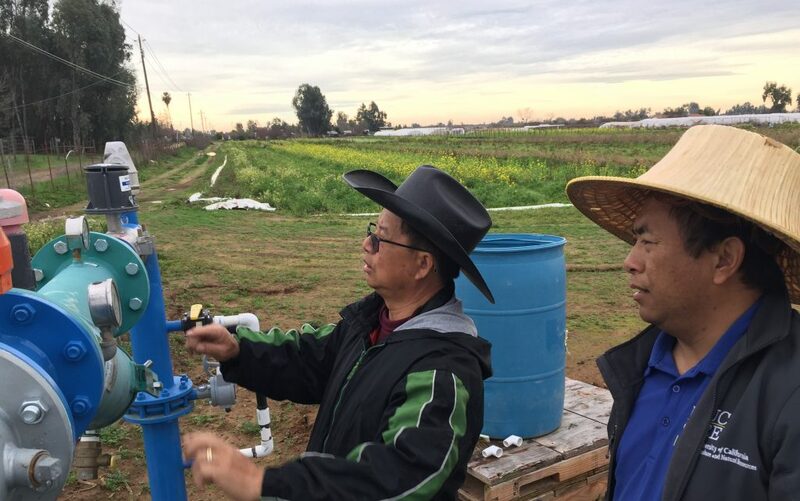 CalCAN’s Executive Director Renata Brillinger visited three Hmong farming operations in the Fresno area that have benefited from a cap-and-trade funded Climate Smart Agriculture program. Launched in 2014 as an innovative solution to the dual problems of water scarcity and climate change, the State Water Efficiency and Enhancement Program (SWEEP) now provides grants to growers for on-farm improvements that simultaneously save water and reduce greenhouse gas emissions. SWEEP is administered by the California Department of Food & Agriculture (CDFA). Read more about the significant water and greenhouse gas-related impacts the program has achieved so far in our recent blog post here. Farmer Xiong Pao Her grows an incredibly diverse array of over 200 different vegetables—many of them traditional Asian foods—including kales, cabbages, bitter melon, lemongrass, sugar cane, beans, peas, and six eggplant varieties. Pao’s grant afforded repairs for pump efficiency and a conversion from furrow to drip irrigation. These SWEEP-funded improvements cut energy and water bills in half and grant significant labor efficiency. Where before Pao and his wife stood waiting at either end of a field until sufficiently flooded, they now turn on their drip irrigation and freely move to the next task on the farm. 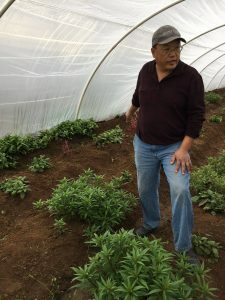 Farmer Pao Yang started farming four years ago on family land recently transitioned from almonds and grapes to a diversified Asian vegetable and herb farm. Once he receives his CDFA payment, Yang will replace valves and install drip irrigation throughout the farm. He anticipates major benefits as a result. He estimates his farm’s annual $8,000 energy bill to decrease by half. Reduced weed pressure due to the more efficient irrigation method will offer a multitude of benefits to his operation, while both reducing labor costs and increasing crop production. Pao Ly, not currently a farmer himself, says that he may one day return to farming. In the meantime, he leases the 36 acres that he owns to ten farmers. With his SWEEP award, Ly will make repairs to his pump to increase its efficiency and implement conversions to drip irrigation on the farms. Both of these measures will significantly decrease the demand for energy and water use in the operations on Ly’s land. Of over 1,000 Hmong farmers in the Central Valley, just 17 have been awarded SWEEP grants so far. The Small Farm Program at UCCE Fresno County determined that technical assistance in applying for SWEEP funding was necessary for small-scale Southeast Asian farmers who were particularly vulnerable during the recent drought and subsequent groundwater depletion. They provided considerable technical assistance to growers, with only partial funding from CDFA, because they perceive it to critical to the mission of the Small Farm Program. More about UCCE Fresno County’s work in providing technical assistance to Hmong farmers here. CalCAN advocates for the funding and provision of technical assistance to be paired with state-funded grant programs for farmers. Many small and medium-sized farmers, like these Hmong farmers in the Central Valley, depend on technical assistance to overcome barriers to receiving state grants, whether it is a language barrier or a tight labor budget and lack of capacity to fill out the applications. SWEEP has the potential to both reduce greenhouse gas emissions and enhance the resilience of California farmers in the face of water scarcity that is increasingly likely to be exacerbated by climate change. SWEEP is an extremely popular program—for every farmer who received a grant in the most recent round of funding, four farmers were turned away. Unfortunately, the California state legislature failed to allocate any funding for SWEEP in the 2017-2018 fiscal year, a huge disappointment to CalCAN and our partners, and a missed opportunity to invest in one of the state’s most cost-effective climate programs. CalCAN and our partners will continue to advocate for renewed funding for SWEEP at a level that meets farmer demand.